Because the Greater Yellowlegs breeds in the mosquito-infested bogs and marshes of the boreal forest of Canada and Alaska, much is not known about its breeding biology. This large shorebird passes through Tennessee each spring and fall on its journey between the breeding grounds and its wintering grounds in the southern U.S., and Central and South America. The Greater Yellowlegs usually forages on mudflats and at the edges of lakes and ponds alone, but may be found in small flocks during migration. Description: Tall, active shorebird with bright yellow legs, thin neck, long dark bill, an upright stance, and square white rump patch. The body is grey brown on top and white underneath; the neck and breast are streaked with dark brown. In fall and winter, it is grayer overall. Bill length is much longer than the length of the head, which is important in distinguishing this species from the Lesser Yellowlegs (see below). Distinctive call can also be helpful in identification. Voice: Flight call is a loud deew deew deew or klee klee klee call given in three or four notes. Lesser Yellowlegs is significantly smaller in size (approximately half the mass) and daintier, and has a straighter, thinner, and proportionately shorter bill (relative to head length). The bill is only slightly longer than the length of the head. Solitary Sandpiper is smaller, has a shorter-billed, a bolder eye ring, a dark rump, and greenish legs. Habitat: In Tennessee freshwater wetlands, mud flats, shallow water flooded fields, sand bars, and pond and lake edges. Diet: Small aquatic and terrestrial invertebrates, small fish, frogs, and occasionally seeds and berries. Nesting and reproduction: Greater Yellowlegs have not been documented nesting in Tennessee. Status in Tennessee: Uncommon, but regular migrant statewide. In spring, found from late February through May with the first southbound migrants found in early July and late migrants found into November. While the Greater Yellowlegs is a well known migrant shorebird in the lower 48 states, its breeding habitat is so inhospitable and mosquito-ridden that it is one of the least-studied shorebirds on the continent. 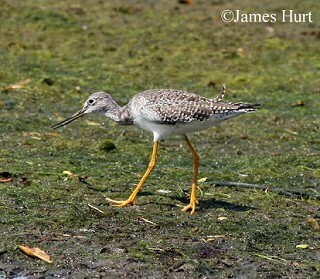 Like many shorebirds, Greater Yellowlegs were considered a fine game bird earlier in the twentieth century. Populations are thought to have recovered since that time, but many aspects of this species' biology are not well known including quantitative data on population trends. Best places to see in Tennessee: Typical shorebird hotspots are good places, including Cross Creeks NWR, Old Hickory Lake, among other places. Elphick, C. S. and T. L. Tibbitts. 1998. 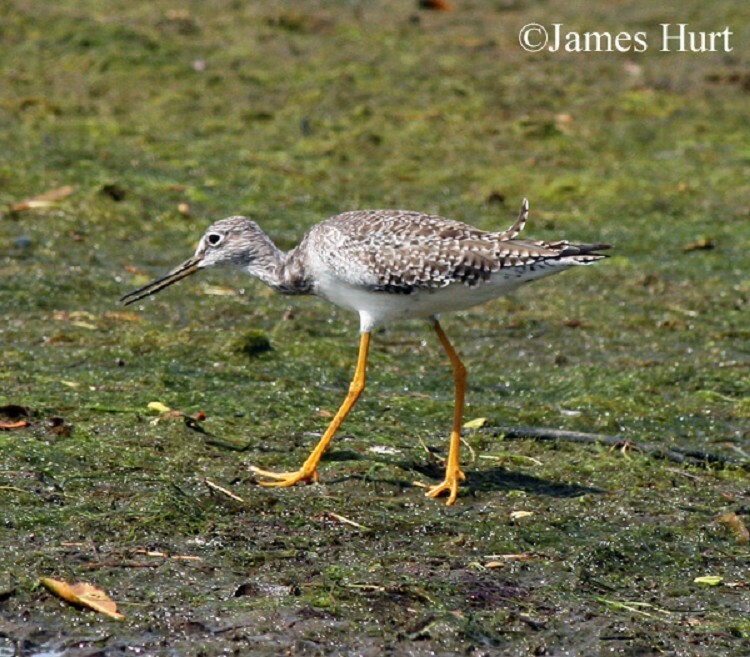 Greater Yellowlegs (Tringa melanoleuca), The Birds of North America Online (A. Poole, Ed.). Ithaca: Cornell Lab of Ornithology.